Pulp science fiction invented a host of directed-energy weapons: heat rays, death rays, blasters, ray guns and disintegrator rays. Lasers joined science-fiction arsenals soon after the Pentagon placed a million-dollar bet on the new idea in 1959. The brand-new Advanced Research Projects Agency was desperate for a defense against Soviet nuclear missiles when Gordon Gould walked in the door with a physically plausible plan to make a laser. Gould’s company got a fat contract, but Gould himself couldn’t get a security clearance to work on the laser. It was Theodore Maiman who launched the laser age when he made the first one in May 1960 at Hughes Research Laboratories in California. Maiman was dismayed when newspaper headlines heralded his invention as a “science-fiction death ray.” His real-world laser was orders of magnitude short of the power needed to blast Soviet nukes out of the sky. Classified experiments reached tens of kilowatts in the late 1960s by burning chemical fuels in a gigantic flowing-gas system that acted like a rocket engine, but it couldn’t match the power of Star Trek phasers. In the 1980s, Ronald Reagan’s “Star Wars” program spent billions trying to make orbital laser battle stations, and managed to get a megawatt out of a building-sized laser for a few seconds at a time. But they never got a big laser off the ground. After the end of the Cold War, the Air Force crammed a rocket-engine laser into a Boeing 747, which got off the ground and bagged a few targets in 2010. But it was billions over budget and many years behind schedule, and was scrapped as useless for zapping nuclear missiles fired by rogue states. However, tests of a smaller rocket-engine laser on the ground in the late 1990s held out a different hope. A joint U.S.-Israeli project called the Tactical High Energy Laser (THEL) could shoot down terrorist rockets before they could wreak havoc. The powers were only a few hundred kilowatts, but the targets were only in the kilometer range, not the thousands of kilometers needed to stop long-range nuclear missiles. Contractors planned how to repackage the five trailers of equipment used in THEL into a mobile rocket-blaster that could be driven to trouble spots. It seemed like a done deal until field operations experts took a look at the plans around 2000. Logistics is crucial on the battlefield. Napoleon Bonaparte famously said “an army marches on its stomach,” but modern armies also need fuel and munitions. A laser is an appealing weapon because it fires bolts of energy, not expensive missiles that can run out in mid-battle. But chemically powered lasers need two fuels, one containing hydrogen and the other containing fluorine, and they produce highly toxic hydrogen fluoride. The field ops team gave them a thumbs down, but said they would be happy to have a laser that could run on electrical power from generators powered by the diesel fuel that is the ubiquitous source of energy on the battlefield. Solid-state lasers that ran on electricity had come a long way in the forty years since Maiman made the first one. Some were used in cutting and welding, but their power was far short of the hundred kilowatt level needed to zap insurgent rockets. Yet Congress and the Pentagon could see their benefits, and in 2000 they created the High Energy Laser Joint Technology Office (HEL-JTO) with a mandate to build bigger and more powerful electric-powered lasers. They planned to crank up the power in two steps to a laser producing the full hundred kilowatts for five solid minutes. Right on schedule, Northrop Grumman announced success. “We’re doing our part to make gunpowder a twentieth-century technology,” said Dan Wildt, head of the company’s laser weapon program, on a March 18, 2009 press teleconference. The laser reached 105 kilowatts, a shade above the desired output power, but its efficiency was a shade below the desired 20 percent. It was an impressive achievement. However, the laser weighed seven tons and filled a shiny metal box 2 by 2 by 2.7 meters, smaller than a 747, but too hefty and fragile for use on the battlefield. It also required banks of laboratory chillers because it generated over 400 kilowatts of heat as well as the 100 kilowatts of laser beam. So JTO pushed on toward more battle-ready lasers. 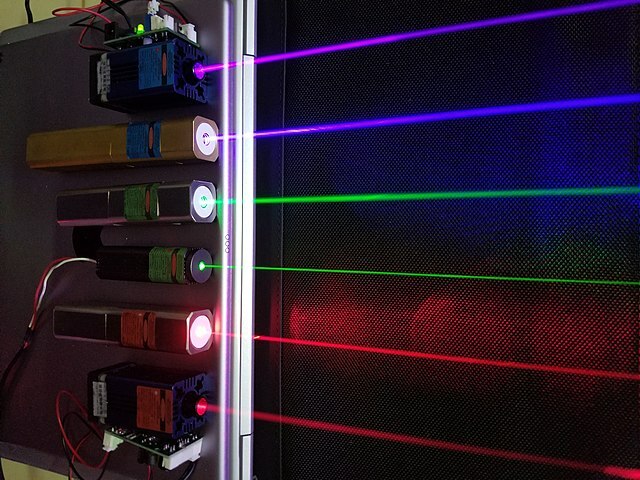 Meanwhile, industrial laser companies had made a breakthrough of their own by replacing old-fashioned laser rods and slabs with thin optical fibers loaded with light-emitting atoms. Fiber laser output powers had soared from around 100 watts in 2000 to tens of kilowatts in 2009. They were so powerful that military labs started buying welding lasers, bolting them onto battlefield vehicles, and adding beam-focusing optics and a joystick-based control stick for aiming the laser. Then they started firing. The easiest targets were improvised explosive devices (IEDs) or unexploded munitions laying on around on a battleground. The drill was simple. Park the vehicle a couple hundred meters away, far enough that the shrapnel wouldn’t hurt anybody. Then turn on the laser and point the beam onto it. The infrared laser beam was invisible to the eye, but infrared viewers revealed it on the screen so the operator could point the beam. When the target was exposed on the surface, after a matter of seconds the explosive inside the shell would detonate with a satisfying BANG, and the driver could move along to the next target. That could be useful for clearing battlefields, although it was harder to deliver enough laser energy to explode well-buried land mines and IEDs. The next step was moving targets. The Army Space and Missile Defense Command in Huntsville installed a five-kilowatt laser atop in a tank-like Stryker in place of the usual heavy gun. It zapped over 150 drones of various sizes before Boeing replaced it with a 10-kilowatt laser. The Navy targeted small boats. A video of one early test showed a boat with a large red outboard motor bobbing quietly on shallow water. Nothing seemed to happen as an invisible infrared laser beam from elsewhere locked onto the motor, but as the beam dwelled on the motor, it began igniting wisps of gasoline fumes, and the motor eventually went up in flames. 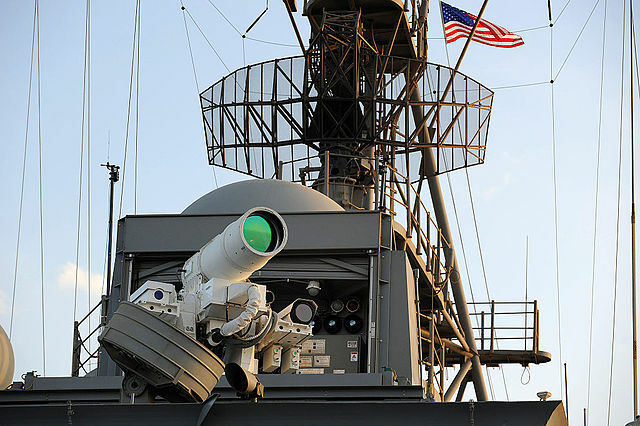 The Navy was the first service to officially “deploy” a laser weapon, installed on the aging warship the USS Ponce in 2014 before it went on duty the Persian Gulf. They bought five 5.5-kilowatt industrial lasers from IPG Photonics, the world’s biggest maker of fiber lasers, and hooked them up to a beam-focusing telescope. The laser wasn’t used in combat, but it did zap test drones and small boats, with impressive success. Laser weapon system aboard USS Ponce in 2014. Tests are continuing with more powerful lasers taking on more difficult targets. 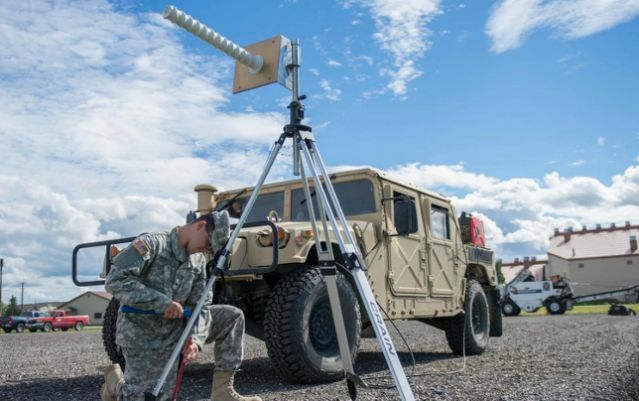 The Army installed a 60-kilowatt state-of-the-art fiber laser from Lockheed Martin in the High-Energy Laser Mobile Demonstrator, a standard military battlefield truck that Boeing has equipped with laser focusing optics and a command and control systems for use by soldiers. 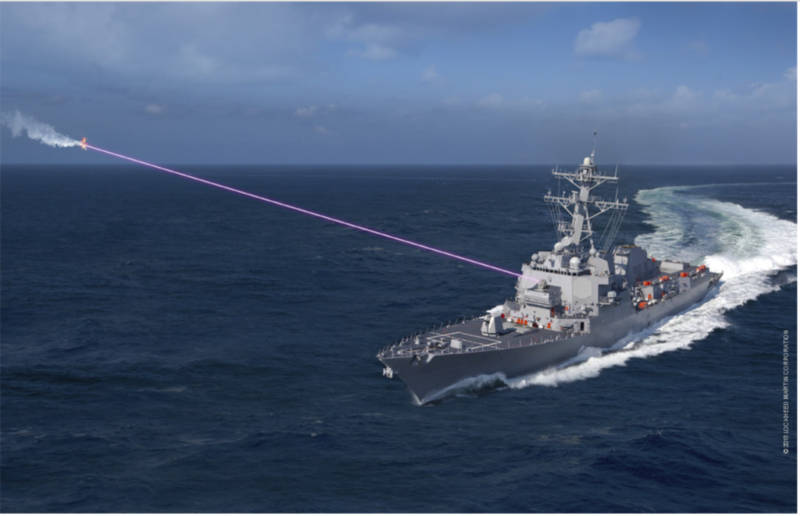 The Navy is buying a pair of similar Lockheed advanced fiber lasers for a new system it calls HELIOS, for High Energy Laser and Integrated Optical-dazzler with Surveillance. In addition to zapping unfriendly small boats and drones, HELIOS will use its optical system to gather intelligence on its environment. It also will include a lower-power visible laser as the equivalent of the “stun” setting on a Star Trek phaser; it will shine so brightly that enemy troops won’t be able to look at it, making it hard for them to attack. One HELIOS will be sent to the Navy by 2020 for integration with the electrical and control systems of a new destroyer. The other will undergo extensive tests at the White Sands Missile Range in New Mexico. The Air Force wants lasers for its top-gun fighter pilots, so it’s developing a laser weapon called SHiELD (for Self-protect High-Energy Laser Demonstrator). A cutting-edge Lockheed fiber laser will be mounted in a pod attached to fighter jets to defend against ground-to-air and air-to-air weapons. Initial tests are to start by 2021. Meanwhile, tests are continuing on a radically different laser design called HELLADS, developed by General Atomic. One big attraction is a remarkably compact and light-weight structure made possible by cooling the laser solid with a flowing liquid with optical properties that match those of the solid so well that it doesn’t disturb the laser beam at all. Another attraction is a modular structure that can double the power by adding a second module, and potentially scale to much higher powers by adding more modules. After decades of disappointment, this time looks different. Lasers that are more compact, more efficient and more powerful are only part of the story. It’s also focusing on targets that are much closer, so the beam has to go through less air, which isn’t as clear as we think. Look across a sunny blacktop parking lot at mid-day and you can see how air currents can bend light back and forth. Another difference is that drones and short-range rockets are much more vulnerable to laser attack than ballistic missiles hardened for re-entry into the atmosphere. Nobody’s talking ray guns or phasers yet. A hand-held laser can’t pack lethal energy, although one could burn a blind spot on your retina. Think of these lasers as defensive artillery that can pinpoint enemy rockets, shells, drones and small boats. Don’t expect these laser weapons to be standard combat equipment next year. The new generation of tests are needed to evaluate the lasers strengths and weaknesses, and to assess their lethality on real-world targets. If lasers pass those tests, they must be ruggedized to withstand battlefield conditions, which are far more harsh than a well-run factory floor. Then they must run a bureaucratic gauntlet to gain approval to move beyond research and development and become a “program of record” that spends buckets of money to produce hardware. That’s a real-world challenge Buck Rogers never had to face. If you hope to one day wake up to the news that scientists have discovered a planet with alien life, the scientists working with the Kepler space telescope have some very good news for you. In a presentation at the Goldschmidt Conference in Boston, researchers from Harvard revealed that the data from the Kepler telescope suggests that water-covered planets are actually a lot more common than you might think. At a symposium in Washington DC on Friday, DARPA announced plans to invest $2 billion in artificial intelligence research over the next five years. In a program called “AI Next,” the agency now has over 20 programs currently in the works and will focus on “enhancing the security and resiliency of machine learning and AI technologies, reducing power, data, performance inefficiencies and [exploring] ‘explainability'” of these systems. “Machines lack contextual reasoning capabilities, and their training must cover every eventuality, which is not only costly, but ultimately impossible,” said director Dr. Steven Walker. A man in South China claims to have created the world’s first ‘flying scooter,’ although we’d be remiss not to point out its resemblance to a large quadcopter drone. According to United Press International (UPI), the aerial vehicle can seat one person and travel at a top speed of roughly 70 kilometers per hour. The machine’s maximum load is 99 kilograms. It took mankind untold eons to learn how to fly, but now artificial intelligence is doing something similar and in a fraction of the time. No, there’s no robots constructing planes like the Wright brothers, but some AI-powered gliders are indeed learning how to cruise through the air just like birds, and they’re getting pretty good at it. For past competitions, she’s created glow-in-the-dark pajamas and a device to pet your dog. But this year, after hearing about the school shooting in Parkland, Florida, she felt compelled to focus on a more serious issue…. Yes, we’ve yet to successfully send humans to Mars, but we already need to start thinking how we can stay there for long stretches of time — or even for good. NASA launched the 3D-Printed Habitat Challenge back in 2015 to find a suitable artificial housing for the first wave of Martian residents, and now the agency has narrowed the contestants down to five after seeing the realistic virtual models they created. The agency and its project partner, Illinois’ Bradley University, judged 18 teams’ models created using a specialized software. The Earth is wobbling, the Earth is wobbling! Saturn sure has a thing for peculiar shapes! Astronomers have known for some time that Saturn’s north pole has developed a very odd hexagonal shape. The massive storm swirling there has well-defined sides, and is a near perfect hexagon. It also has a habit of changing color. Now, using images gathered from the Cassini mission (rest in pieces), a new study reveals that there’s not one, but two massive hexagons swirling on Saturn’s northern half, and the new one is even higher than the other. As LiveScience notes, scientists haven’t figured out if the two are actually connected in any way, but it would be a pretty wild coincidence if they’re not. Ever since Captain America debuted in Marvel Comics, scientists have been getting closer and closer to creating real-life super soldiers. With the help of Professor E. Paul Zehr and his new book ‘Chasing Captain America’, we’ll explore the origin and history of the Star Spangled Man and explain the science of the super soldier serum that turned Steve Rogers into the Sentinel of Liberty! Australia’s Great Barrier Reef has seen better days. The massive natural wonder is dealing with the impacts of ocean warming (thanks to manmade climate change) which have pushed species away and killed off massive sections of coral, but that’s not the only problem the reef has been forced to deal with. More recently, an influx of starfish have begun to take over the reef. This is thought to be the result of chemicals from human activity running into the ocean. As CNET reports, some of those chemicals can have the unintended effect of promoting breeding due to increases in algae, which is exactly what the starfish look for to keep their offspring alive. But now, researchers have a robotic ally to keep starfish populations in check, and it’s a real killer. Lionfish are incredibly eye-catching creatures, and they’re a favorite of salt water aquarium enthusiasts because they just plain look cool. They’re also an incredibly troublesome species when they are introduced in areas where they don’t belong, and coral reefs in the Caribbean are under serious threat from an invasion. Now, researchers from the Worcester Polytechnic Institute have developed an autonomous robot that is capable of hunting down lionfish all on its own. But the bot doesn’t just identify and kill the invasive fish — using sharp spears to snag the fish and bring it down — it also allows for the dead fish to be fetched by fishermen who can harvest and sell it. Is humanity about to accidentally declare war on an alien civilization? …So let’s say we get it right. We develop the right material to reflect enough of the laser light that it doesn’t incinerate the sail. We collimate the lasers well-enough and build a large-enough array to accelerate these starchip spacecrafts to their designed speeds of 20% the speed of light: ~60,000 km/s. And then we aim them at a planet around a potentially habitable star, such as Alpha Centauri A or Tau Ceti. Perhaps we’ll send an array of starchips to the same system, hoping to probe these systems and gain more information. After all, the main science goal, as it’s been proposed, is to simply take data during arrival and transmit it back. But there are three huge problems with this plan, and combined, they could be tantamount to a declaration of interstellar war…. Compiled by Carl Slaughter: (1) Black hole pairs: “Scientist Find Treasure Trove of Giant Black Hole Pairs”. (2) It’s for you: “Scientists made the first ‘unhackable’ quantum video call”. (3) NASA / Russia moon station: “NASA and Russia agree to work together on Moon space station”. (4) I like ?. Pi, the Golden Number, impossible engineering, and the Egyptian pyramids..
By Carl Slaughter: (1) E.T.’s stand-ins. US military preparing for alien attack and Cold War in space. Reader reaction: “Build a dome around the Earth and make the aliens pay for it.” — “US military training space warriors for ‘extraterrestrial conflict'”. A real life Independence Day may not be far away. Only this time there is no defined threat the military is working against, although it is about “extraterrestrial combat”. Space Aggressors is what the US military is calling them, a team of soldiers training at a warehouse near Colorado’s Rocky Mountains. Their job is to act like the enemy during mock space battles to help US units prepare for a conflict that may one day extend to outer space. “We play the bad guys,” Captain Christopher Barnes, chief of training for the 26th Space Aggressor Squadron told the Seeker. “We study threats to the space realm, either coming from space or based on land. If we can’t directly replicate them with hardware, then we figure out if there’s a software solution or some way we can train people to the point where they can fight through them, if they have to, in a conflict,” he says. If you’re one of the tens of millions of Americans who will experience the Great American Total Solar Eclipse on Aug. 21, hopefully you’ve heard by now that you’re going to need eye protection for the big event. Technically, all of these are misrepresentations of holography — either special cinematic effects, video projections onto water and smoke, or a hi-tech version of an old Victorian stage trick called Pepper’s Ghost. But holograms are big business. It is suggested that by 2020 the market for genuine, display holograms will be worth US$5.5 billion — so how are they impacting society? Here are five of the most incredible ways they are being used. Geographic intelligence is an essential part of military strategy and fully dimensional holographic images are being used to improve reconnaissance. One American company has delivered over 13,000 3D holographic maps of “battle-spaces” for the US army. This allows soldiers to view three-dimensional terrain, look “around” corners and helps with mission training. The company does this by taking complex computerised image data, which they make into a holographic sheet. Not only can users “look into” the high quality 3D image of the terrain stored in the hologram sheet, but the technology is simple to use and can be rolled up for easy storage and transportation. It all sounds very Star Wars, but the maps are also useful in disaster evacuation and rescue scenarios. (4) Drones. Court strikes down FCC regulation requiring drone registration. “The FAA was just forced to lift its drone registration requirements”. Being a drone owner requires a few things. You need decent amount of cash if you want the high-end hardware, along with the patience and willingness to learn how to actually fly the thing. As of 2015, you also needed to register the aircraft (if weighs a half pound or more) with the Federal Aviation Administration. Now, a federal court in Washington, D.C. has ruled against that requirement, deeming the FAA’s mandatory registration “unlawful. By Carl Slaughter: (1) Chinese cowboy astronauts. “China considering mission to ‘capture’ asteroid and fire it into moon’s orbit”. China plans to ‘capture’ an asteroid by landing and anchoring a spacecraft on its surface, fire up multiple rocket boosters and project it into the orbit of the moon. (2) Welcome to the Moon, Chinese astronaut. Now park it. “China simulates extended moon stays amid space drive”. 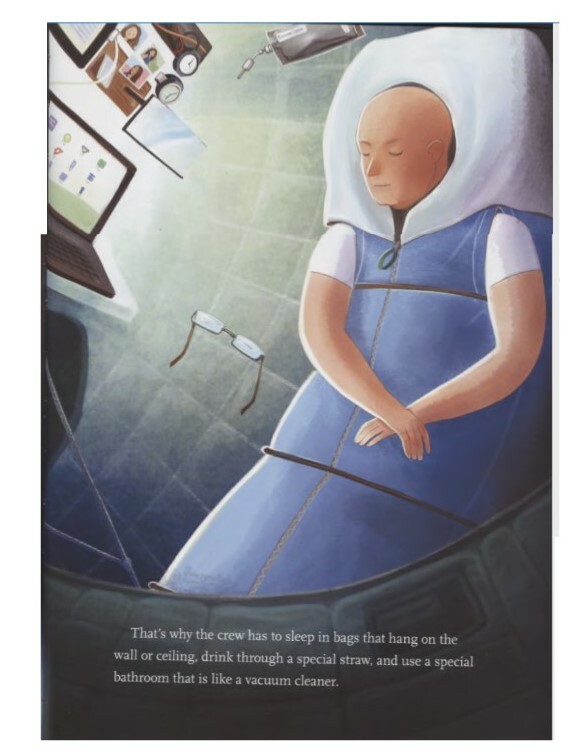 (3) Latest Silicon Valley perk: freeze your (dead) body. 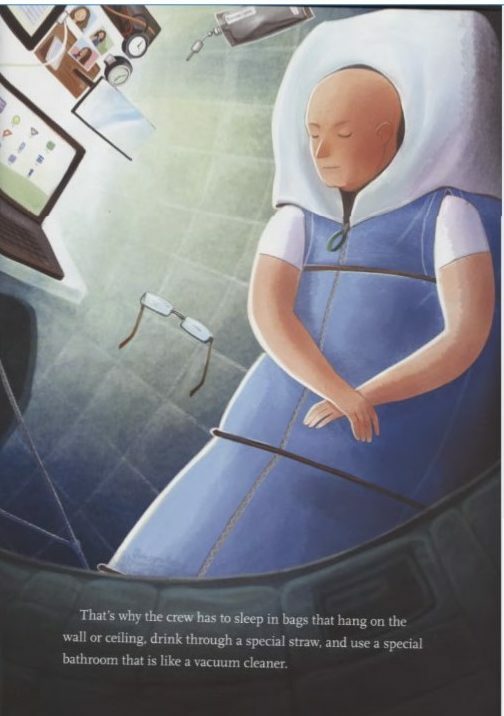 “Cryonic freezing is the coolest employee perk in Silicon Valley — literally”. (4) Bioprint – body parts from 3-D printers. “Ability to ‘print off’ new body parts within next 10 years as 3D bioprinting continues to grow”. President Donald Trump can’t seem to make up his mind about whether to keep the U.S. in the landmark Paris Climate Agreement or pull out of the pact altogether, but there are signs he is getting advice from across the ideological spectrum. (6) Robots are getting closer to fully imitating human motion. “This bipedal running robot is the last thing you’ll see before robots claim the Earth”. By Carl Slaughter: (1) Trump bring space council out of retirement. “Executive Order Creating National Space Council Expected Soon”. The recreation of the council, which last operated during the administration of President George H.W. Bush a quarter-century ago, could play a key role fostering the development of so-called Ultra Low-Cost Access to Space (ULCATS) systems, said attendees of a symposium here on the subject. (2) Planet cloaking technology, and why we should use it. “Why And How Aliens May Know Humans Exist”. What would it take to hide an entire planet? It sounds more like a question posed in an episode of “Star Trek” than in academic discourse, but sometimes the bleeding edge of science blurs with themes found in science fiction. Of course we’ve been leaking our own position to distant stars via radio and television signals for six decades now, largely ignorant of the cosmic implications. But several notable scientists, such as Stephen Hawking, have publicly voiced concerns about revealing our presence to other civilizations. These concerns largely draw from the darker chapters of our own history, when a more advanced civilization would subjugate and displace a less advanced one. It might be too late for us to withdraw back into invisibility, but maybe not for other intelligent alien civilizations out there. A far-off planet’s inhabitants might prefer to hide from the likes of us. Recently, my graduate student Alex Teachey and I published a paper that proposes a way to cloak planets, as well as a way to broadcast a civilization’s existence. Even if we’re not manipulating our own signal in this way, it doesn’t mean other planets out there aren’t. It’s possible what we see as we scan the universe for other habitable planets has been engineered to disguise or highlight the existence of other civilizations. Chinese inventors have created a $14 million fighting robot called “The Monkey King”. This is the third “gladiator” robot to be revealed, after the US and Japan unveiled their models. (4) Space exploration summit in Washington, DC, May 16th. “Senator Ted Cruz, NASA’s Acting Administrator Robert Lightfoot, Space and Mars Experts to Join The Atlantic’s Summit on the Future of American Space Exploration”. Space discovery has been an enduring source of national pride, since Project Mercury and the Vostok Program first competed to put men into orbit in the 1950s and ‘60s. In recent years, new players have taken prominent roles in ambitious missions, including space tourism and missions to Mars. At this junction in space exploration, The Atlantic will convene “On the Launchpad: Return to Deep Space,” a summit gathering policymakers, key players from NASA, and space industry experts to explore the future of extraterrestrial travel on Tuesday, May 16, at the Newseum in Washington, D.C.
(5) “Scientists should just be political.” – The Atlantic. “The Case for the Politicization of Science”. 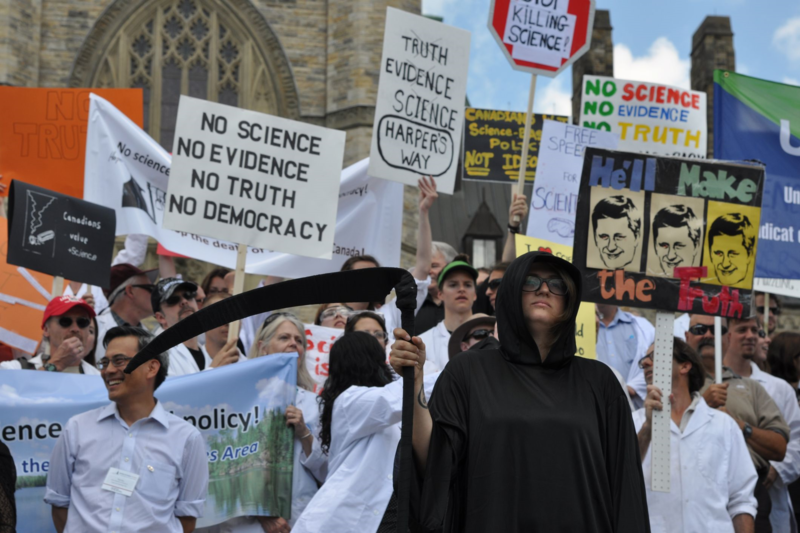 … In the summer of 2012, in the wake of the introduction of Harper’s most aggressively anti-science budget, a few hundred protesters marched from an Ottawa conference center hosting a biology symposium to Parliament Hill, in a protest styled as a mock funeral for the Death of Evidence. As in the March for Science last weekend, many of the Ottawa marchers were working scientists who’d never before participated in a protest. Many wore white lab coats to signal their allegiance to a set of principles long assumed to be above the partisan fray. Five years later, the Canadian government and its institutions are back in the hands of leaders who respect the scientific method and value the expertise of scientists on their payrolls (and beyond)….